Form: This statue's anatomy is considerably more realistic than earlier sculptures. The musculature is softer, and more sensuous and there is even a bit of body fat. Although the statue is in contrapposto position to indicate slight movement the "S" curve of the body is heightened and the movement is more exaggerated by the arm that is held aloft. The head of the adult figure is turned towards the infant that is reaching towards the extended arm. This sculpture although still frontally oriented, is even more in the round than others. The viewer can begin to move to the far left and right to see a more interesting and complete view of the figure. Iconography: This sculpture probably represents Hermes and Dionysus. Hermes is the wing footed messenger god who served as a temporary "nurse maid" for Dionysus in order to protect the young god from Hera. Hermes is holding out a bunch of grapes, and young Dionysos's reaching for them is prophetic symbol of Dionysos's role as the god of wine. The scene is a bit of a genre scene and probably symbolizes the more humanistic or playful attributes of the gods. 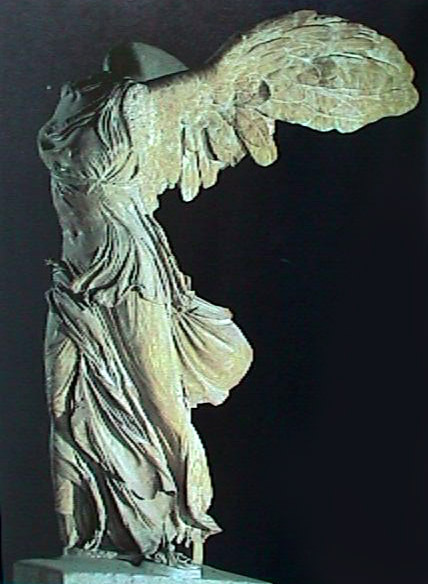 Hellenistic Form: This sculpture is a massive sculpture of a composite creature known as a Nike. The convincing anatomy is heightened by the use of wind whipped wet drapery of her chiton and the forward moving posture of the figure. Originally this sculpture would have had extended arms and probably a face with a fierce facial expression. She is placed on the prow of a stone boat. 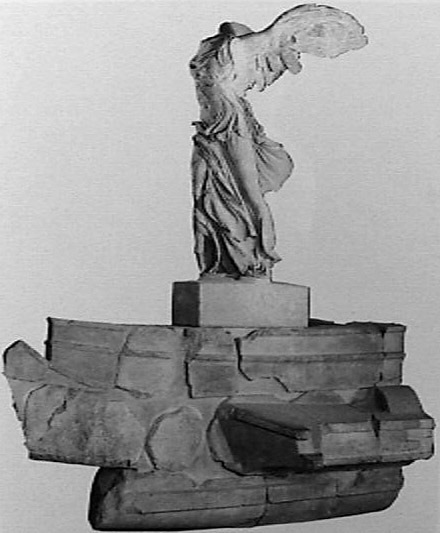 Gardner describes that the setting of the sculpture would have been augmented with the sculpture's placement in the upper basin of a two tiered fountain that would have suggested to all the senses that the ship was moving and splashing through the water. Hellenistic Form: The anatomy of each of the three figures are illustrations of ideal anatomy for their ages. The counterpoise and twisting of the figures, while not contrapposto (which is a standing pose) is a pose that inspired Michelangelo. Michelangelo referred to such twisting and turning as serpentata (serpentine). The individuals' faces are highly dramatic and expressive and the figures themselves interact with each other and with the serpent that attacks them. Overall, this is one of the best examples of how Hellenistic art pushed the envelope from the Classic period. Iconography: This sculpture represents an episode out of the Roman poet Vergil's Aeneid. This particular scene recounts an event about the Fall of Troy. 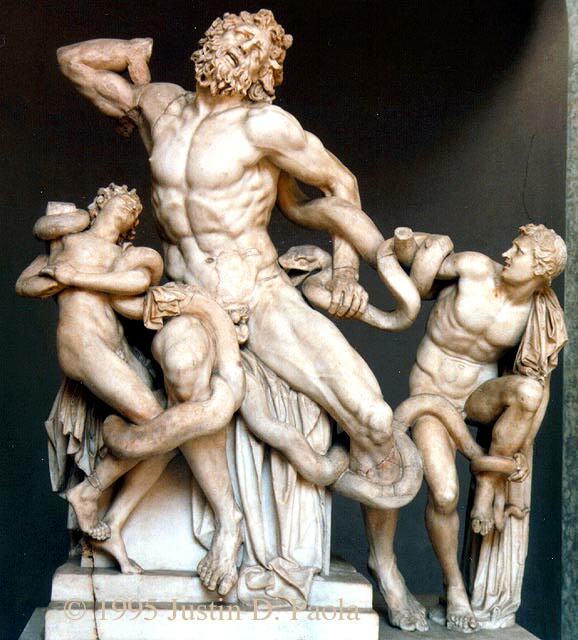 Laocoon, a celibate priest in the service of Poseidon, was punished by Poseidon, for acts of hubris against the god. (Hint: Notice he has children) Another interpretation of this tale and his subsequent punishment was that he warned the Trojans "Beware of Greeks bearing gifts" when they opened the gates and were presented with the famous Trojan horse in which Odysseus and his men hid. Either interpretation of this yields that this sculpture is a warning against interacting with or offending the gods.